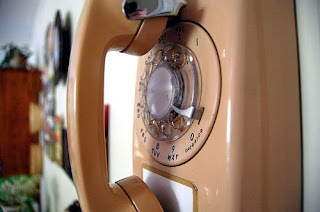 The family phone hung on the kitchen wall, an arm’s reach from the sink and table, its cord hung to the floor, stretched and twisted by our efforts to have a private conversation in a home crammed with people. Getting the phone wasn’t easy, but then nothing was after my parents moved us to Silver Springs, a patch of scrub brush pocked and brittle from the hot, dry wind. We were the first to move onto Badger Street, and our tin trailer was an island in this ocean of tumbleweed and alkali. For you see, we moved in without electricity, running water, nor telephone. Why? I shrug. Can any child explain their parents’ actions? Maybe they were too tired or too poor, it doesn’t really matter, because the end result was the same: A lonely family, marooned in the desert. The telephone became my mother’s mission. She couldn’t afford to bring the power line down our street, and the task of building a water tank and windmill was my father’s. But she could dig the ditch and lay the phone line to connect our trailer to the rest of humanity. There I picture her, a strong, determined woman in waffle-stomping hiking boots and shorts, tank top exposing breast and unshaved armpit, digging to keep herself sane. Prompted by Sunday Scribblings challenge of the week: Phones. What a beautiful post filled with incredible images. I could see your mother digging that ditch. And I could hear the phone ringing and connecting you to the rest of the world. Incredible.